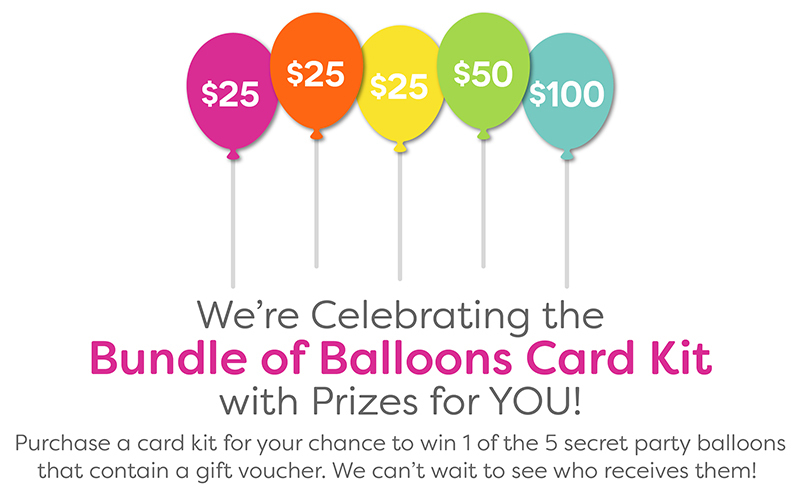 The Bundles of Balloons card kit is available now! Quick, go get one, I'm sure they won't last long! 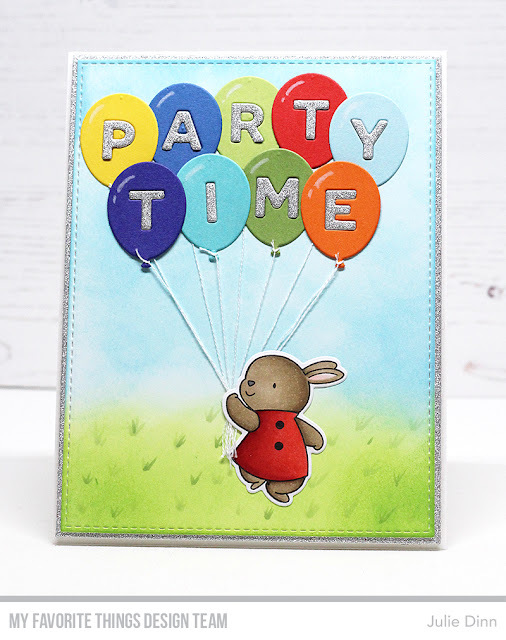 For my card today I created a bouquet of balloons for this sweet little bunny to hold. The bunny is from the Bubble Over with Joy stamp set, isn't she cute? I stamped the image on X-Press It card stock and colored it with Copics. We've got a fun surprise for you this month. You could win one of five gift vouchers! We are hiding five gift vouchers in five random kits. The perfect character to ground a bunch of balloons...love that bunny!! Bunnies and balloons how cute is this! Everybody is having a party...Yippee! Such a cute bunny and I love the sparkly letters in the balloons! the shading on that bunny is fantastic! I need this kit! This card is just too adorable! Like the bunny with the balloons! Sweet card! Love all the colors and the cute little scene you created. Love that darling bunny and the festive balloons! Sweet card! Too cute! Your card is adorable! Such a cute invite. Love the bunny. Oh my! This is the deluxe version of cuteness overload!! I get so excited every time I see that little bunny. I love your card and I like that you paired the balloons with another set. This is reason million + 1, as to why I can’t wait to get my hands on this kit - so versatile. This set will get plenty of use and is well worth the money. Super card, I love the silver and the great colours and shading. This is the cutest. Love it a lot. That is just the cutiest little bunny and just love the message she is carrying. Such a cute card! I love that these balloons can be paired with so many of the adorable MFT animals! How adorable is this little bunny ! Awww, I love seeing the balloons combined with all of MFT's adorable stamp sets! That bunny is an excellent choice to be holding balloons. She looks like she's skipping along with them! Thanks for sharing this sweet idea with us. Cute bunny and I like the colorful balloons and the sparkly letters. The little bunny is so adorable skipping through the grass! Love it! How adorable is that?!? It's a card that just makes you smile. Love the bunny with his big bunch of balloons. I just love this card kit but now it’s sold out with no more coming! I hope we’ll be able to purchase the dies at least. I gotta have it! Very cute & colorful card! So adorable, the bunny and the balloons! Love the rainbow and sparkles!